The printer is one of the most diverse pieces of equipment in any office. The printer is one of the most diverse pieces of equipment in any office. With the capabilities of faxing, scanning, and copying, picking the correct printer is absolutely important. Depending on your line of work though some printers might have too many features and may be unnecessary for your office. Let’s explore the most common options for printers. A good place to start is determining the very basic features your office needs in a printer. If you work with other people and everyone needs access to a printer getting a wireless printer as opposed to a wired one is much more convenient. What about color? Will there be any need in your office to print out color or will monochrome do? Consider multi-functional purposes for a busy office to combine different equipment. Remember most office printers come with technical support and they are generally easy to reach to ask the questions to determine the best printer for your office. While expensive upfront, these printers provide high-quality text using toner. In a basic office setting buying a Laser/LED printer might be a good choice. Laser printers can handle much higher volumes of printing while consistently printing faster. These printers are popular for personal use and home offices. Inkjets use ink that is dispensed through a pinhead. These printers are less expensive upfront and are much better when it comes to photo quality and color. Most bigger offices probably won’t be able to find an inkjet printer due to the high cost of ink. 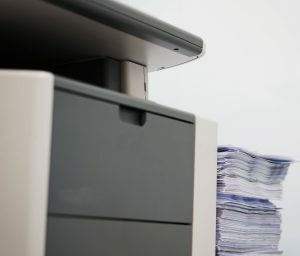 Two-Sided Printing: While sometimes this is an option for other printers, there are certain office printers that will do this automatically without someone having to re-feed the paper. Memory: Discuss with your office IT and decide how much memory you will see to keep things running smoothly. Multi-Purpose Trays: Do you need to print on labels or envelopes or business cards? Considering this can also affect what printer you get. This entry was posted on Friday, May 12th, 2017	at 11:11 am	and is filed under New printing equipment	. You can follow any responses to this entry through the RSS 2.0	feed. Both comments and pings are currently closed.